How do historic places live for now? This was one of many questions presented during the 2018 Exhibit Columbus National Symposium held in Columbus, Indiana, from September 26 through 29. Using many of Columbus’s High Midcentury Modern structures as venues, curators, architects, and creators explored how architecture, art, and design can be used to make better places to live and inform new approaches to preservation that incorporate modern heritage and civic initiatives into the future of cities. A collaboration between Landmark Columbus, AIA Indiana, AIA Kentucky, Docomomo US, and Newfields, Exhibit Columbus kicked off with alternating programming, featuring a symposium one year and an exhibition the next. This year’s Exhibit Columbus National Symposium complements the 2019 Exhibit Columbus Exhibition, which invites artists and architects to create outdoor works that are inspired by and communicate with Columbus’s more than 80 structures, works of art, and landscapes designed by significant architects and artists, including Eliel and Eero Saarinen, Robert Venturi, Harry Weese, I.M. Pei, and Alexander Girard. Exhibit Columbus follows the original ethos of philanthropist and Cummins Corporation executive J. Irwin Miller, who saw the built environment as a means to create social change and saw a need for the revitalization of his hometown as it approached the mid-20th century. Establishing the Cummins Foundation in 1954, Miller offered to pay all architect fees for new public buildings in Columbus, which brought emerging architects to the small midwestern city to build schools, factories, offices, and houses of worship, and kickstarted the architectural radicalism that Columbus now defines itself by. The 2019 exhibition will bring 18 projects to downtown Columbus, including five J. Irwin and Xenia S. Miller Prize Installations, five Washington Street Installations, six University Design Research Fellowships, and the design team from Columbus High School’s C4 program. The symposium’s intent was to activate multiple aspects of the afterlife of historic places, giving the exhibition a collaborative, thoughtful context. 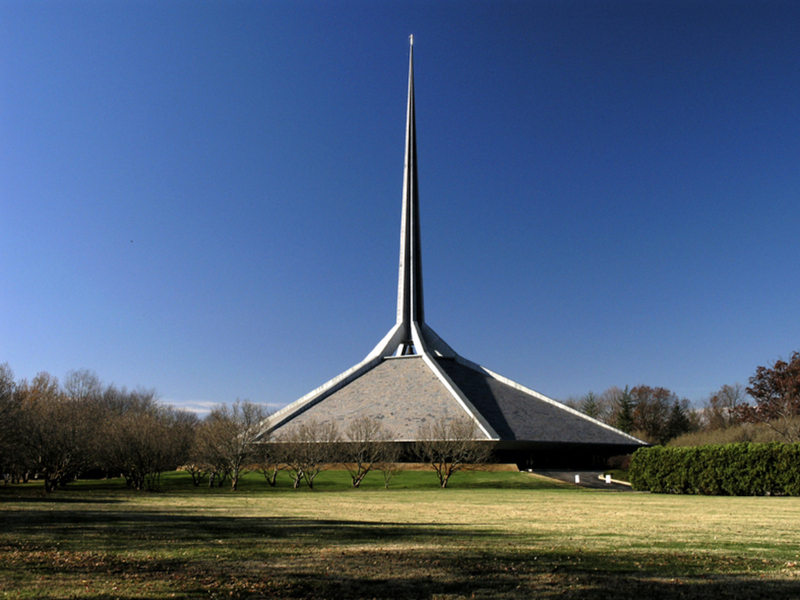 While the bulk of the content related to Columbus’s High Midcentury Modernism, the conversations explored other sites and projects where progressive preservation has been implemented. The Cranbrook Center for Collections and Research’s recently-acquired Usonian Smith House, and #NEWPALMYRA, an effort to reconstruct the ancient Syrian city of Palmyra as a virtual environment, were both part of separate discussions on interpretation and connection. The sense of progressive preservation at Exhibit Columbus was refreshingly unburdened by the lack of old-school historic preservation and architectural history thought chains, and discussion instead focused on innovation, creativity, and participation over historical facts delivered by academics. This was clearest in the presenters’ choice of language; the overwhelming use of “cultural heritage” over “historic preservation” during sessions brought the field in America one tiny step closer to the cultural, community-centric model practiced in Europe. Discussions on sustainability looked at the role that historic architecture and design might play in making cities more equitable, not as the central pillar of the well-worn idea that the greenest thing is what’s already built, or the notion that a community can only venerate one period and thesis of historical significance. The most vital discussions occurred around exhibitions as civic action, and how historic sites might break out of their stasis and engage future creators and users of design, culminating with the introduction of the J. Irwin and Xenia S. Miller Prize Recipients, an exciting collection of firms tasked with creating the site-responsive installations that will mingle with Columbus’s existing heritage, a vision of the creative future of Columbus that could work anywhere.